EXCESS Challenge – January’s top “virtual skippers”! The 32.6′ J/99 is equipped with a powerful, easily controlled keel-stepped rig, which optimizes the boat’s reaching and downwind sail configurations. As a result, the J/99 is designed to plane in 17+ knots of breeze, but won’t drag extra wetted surface in light airs. It is designed to be IRC/ORC rating friendly, not too far from the successful J/97, but longer on the waterline with less overhang. 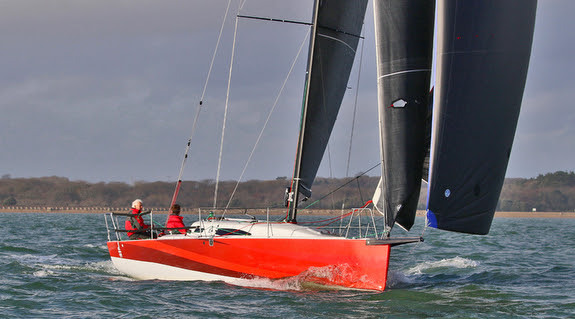 The trial certificate for boat number one, which we sailed at the turn of the year on the Solent in seven to 10 knots of chilly breeze, comes in at 1.015, comparing favorably in between the JPK 1010 (about 1.006) and the Jeanneau SunFast 3600 (around 1.040)….read more below. Here is a link to the article posted online.